Edward Weston is regarded by many as one of the most influential photographers of the twentieth century. Interest in Weston extends beyond his images, to that of his colourful life. His many relationships and his thinking processes are well documented; alot written by Weston himself in his Daybooks. It was in these journals, written over two decades, that Weston recorded his thoughts about his own work and the highs and lows of life as an artist; as well as writing about his many lovers and friends. Ever since I discovered Weston’s work in the mid eighties when I was a young art student I have been fascinated with Weston as a phenomenom. Weston was clearly a passionate artist and one who ‘wore his heart on his sleeve’ to use a modern expression. It was this passion about life as well as art, which for my mind, makes his work far more interesting than his contemporaries, including Ansel Adams. Knowing more about Weston ‘the man’ helps understand Weston ‘the artist’. Over the years I have collected many books about Weston but the one thing I always wanted to see was Weston ‘in action’ and to see how he lived. It was to my great delight that I discovered that a 1948 short film about Weston was available via the web. ‘The Photographer’ was made by Willard Van Dyke, who before switching to cinematography had been a photographic contemporary of Weston and was a founding member alongside him of the f/64 group. Admittedly the film is not the greatest piece of film making. It was produced for the United States Information Agency and could be described as quaint propaganda but it does show Weston at home at Wildcat Hill and revisiting some of the locations he made famous at Point Lobos, Oceano, Death Valley and Yosemite. 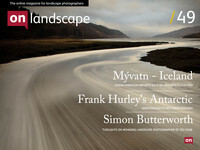 The commentary, whilst bordering on the saccharin in places, does explain why a landscape photographer works as he does. Reportedly, during the filming Weston assisted by Dody Warren and his son Cole, actually shot some early colour transparencies for Kodak. It was just prior to the film that life had dealt Weston two cruel blows - he had been diagnosed with Parkinson’s and he had separated from Charis Wilson who was surely the love of his life. In the film we see a frail Weston who has lost a lot of the vitality that made him such a charismatic figure but for anyone interested in Weston’s work it is a rare and important record. You can watch the video on You Tube or better still you can download a much higher quality transfer from the original 16mm film. Mac users might find the soundtrack is missing if using Quicktime - try using an alternative player such as VLC if that is the case.